South Africa-based label printer Universal Labels & Packaging has purchased a new flexo press from printing and converting machines firm MPS Systems to boost operations. The purchase of MPS EF 430 flexo press, which marks fourth MPS investment for Universal Labels & Packaging, was through Rotocon, a provider of consulting and services to South Africa label converters in the narrow web industry. The MPS EF automated multi-substrate flexo press is designed for label production and flexible packaging printing on thin unsupported film or thick cartonboard. 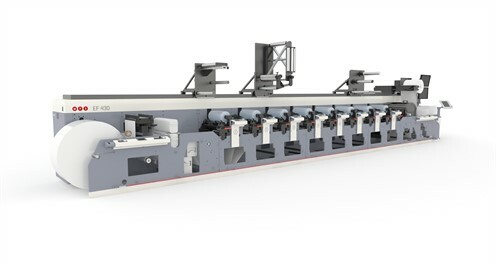 In addition to providing improved flexibility, the machine will allow operators to maximize press performance, as it offers ease of operation and reliability. MPS said that Universal Labels also purchases its flexible dies, print cylinders, and rotary dies through Rotocon. Universal Labels & Packaging currently operates 16 printing presses including digital, offset and flexographic at its ultra-modern manufacturing facility located in Midrand, South Africa. The offers self-adhesive labels, wraparound labels, in-mould labels, shrink sleeves, flexible packaging, sachets and tags, with a primary focus on the FMCG market. Recently, US-based Outlook Group has purchased a new 17-inch, 8-color EF press with automated print pressure settings from MPS Systems. MPS is engaged in providing flexo and offset press solutions for label and flexible packaging printers. Image: A MPS EF 430 flexo press. Photo: courtesy of MPS Systems B.V.